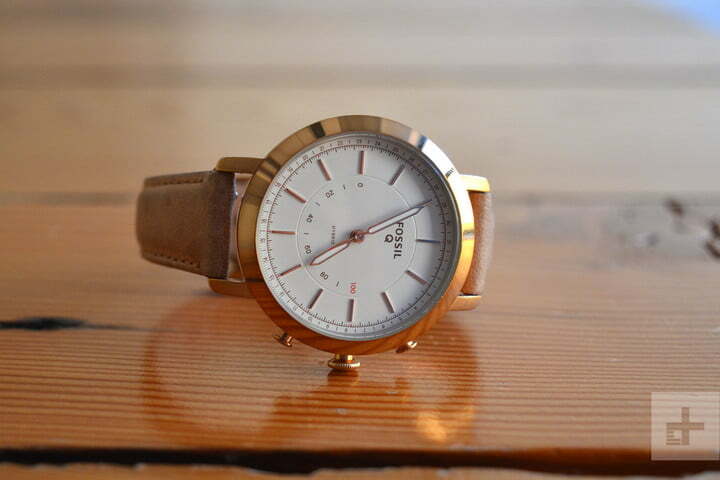 Fossil is continuing its promise to turn all its analog watches into hybrid smartwatches with the Fossil Q Neely. 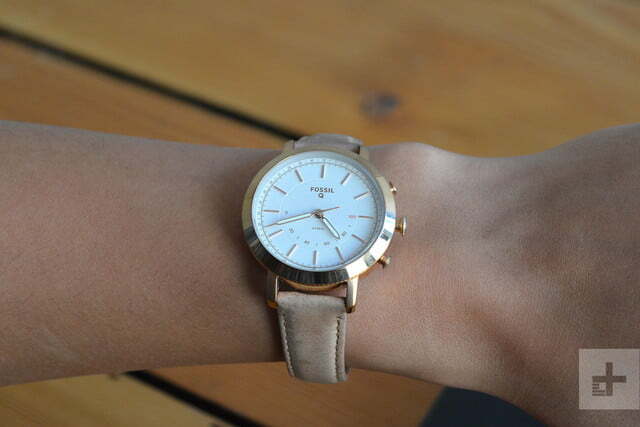 The Q Neely is not only a women’s hybrid watch, but it’s the company’s smallest to date. Other than size, there’s not much else that distinguishes the Q Neely from other Fossil hybrid smartwatches — it can track basic fitness activity, alert you to notifications, and control functions on your smartphone, all in an attractive and small package. Let’s take a closer look. 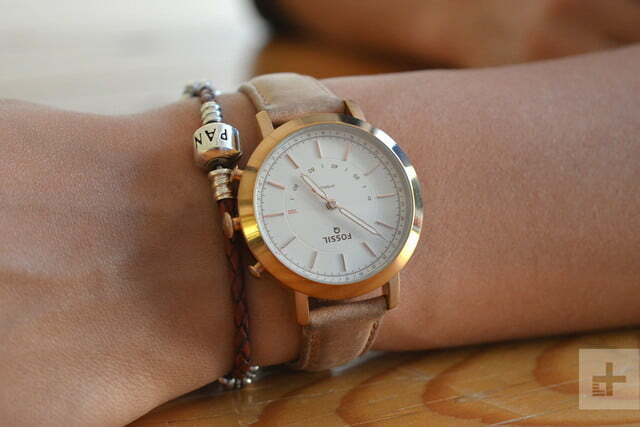 The Q Neely is ideal for women with with small wrists, or women who don’t like large watch faces. 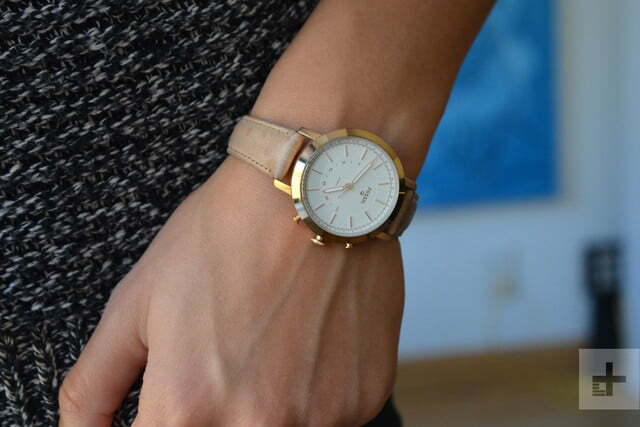 The smartwatch is dainty, but the traditional analog design paired with a leather watch strap makes the whole package extremely chic. The case size measures 36mm with a thickness of 12mm, which makes it the same size as the Skagen Signatur T-Bar, but the thicker bezels around the Neely make it look much smaller. 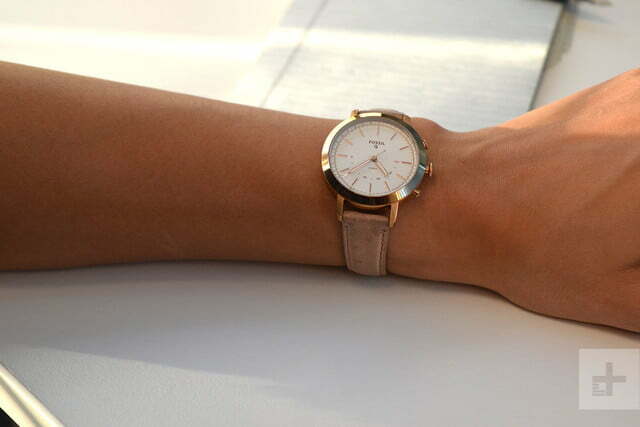 Within Fossil’s large hybrid watch collection, the Q Neely is as small as it gets. There are three buttons on the right side, and they’re each meant to trigger different functions you can set via a companion app (more on this later). Our review model has a white face, with a rose gold case and a bone leather watch strap. The rose gold compliments the light-tone watch strap beautifully, and the case never lost its shine even more than a month of wear. 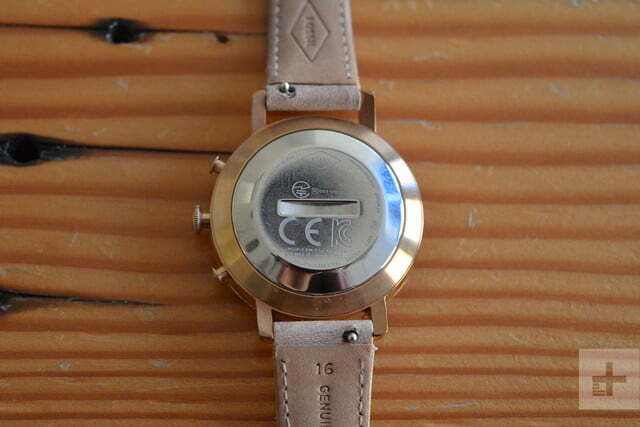 The white dial is outlined with the same gold color, which is a minor detail, but it makes the watch face pop. We found the watch pairs well with a wide variety of other jewelry; we didn’t feel the need to plan our outfits around it. 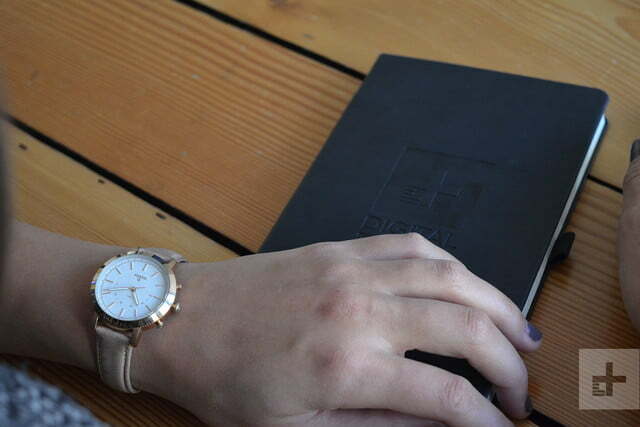 The Q Neely quickly became our go-to smartwatch, as it looks and feels luxurious, while subtly blending in with any outfit regardless of the time of day. 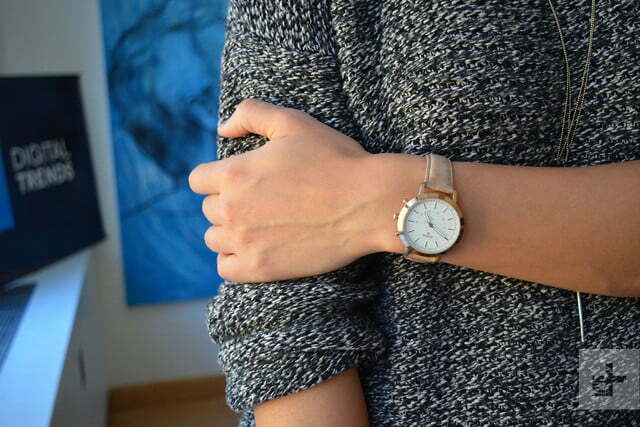 It’s dainty, but the analog design paired with a leather watch strap makes it look extremely chic. 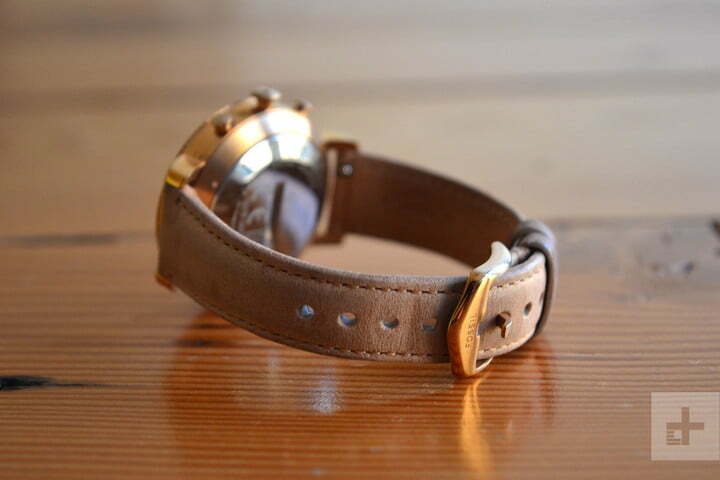 Unfortunately, the leather watch strap doesn’t age too well – some parts of it became more dark than others, spoiling the look. 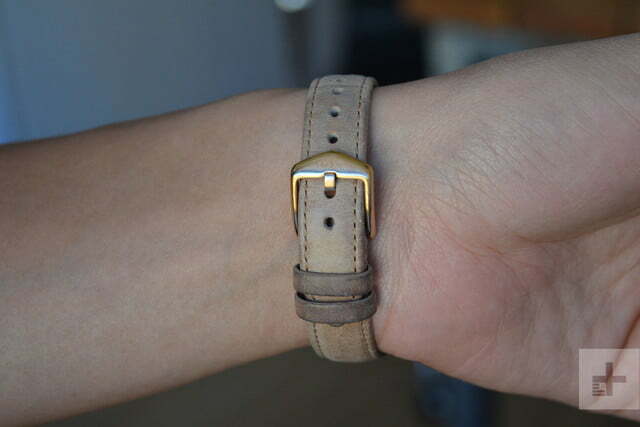 The bands are interchangeable though, so you’re free to switch out the original one for any other 16mm strap. The Q Neely comes in two other colorways – a rose gold case with a cabernet leather watch strap, as well as a silver case with a black leather watch strap. While we didn’t get to test them out, you might want to go for the darker straps to avoid the issue we experienced with a more lighter color one. 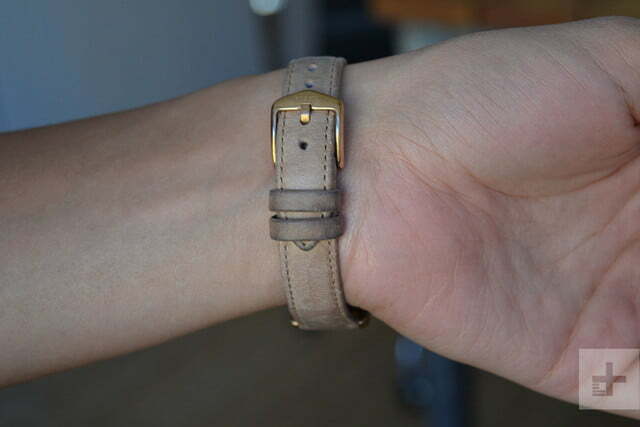 Most importantly, the watch sits comfortable on the wrist, with enough notches in the strap to find the perfect fit. Its small size and traditional watch design conceal all the watch’s smarts, which is impressive because there are quite a number of functions you can perform on the watch. The Q Neely pairs with your iOS or Android smartphone via Bluetooth with the Fossil Q app. Using the app, you can set each button to trigger functions like control music playback, call your phone, take a photo on your phone, and more. There are preset configurations made for fitness or music, but you can easily customize and save your own configurations to fit your needs. One of our favorites is the Commute feature, which uses Google Maps to calculate the time you will reach a pre-set destination, like your work. We set it to the third button on our watch, and found its calculations consistently accurate and reliable when we wanted to know how long it would take us to get home from work. 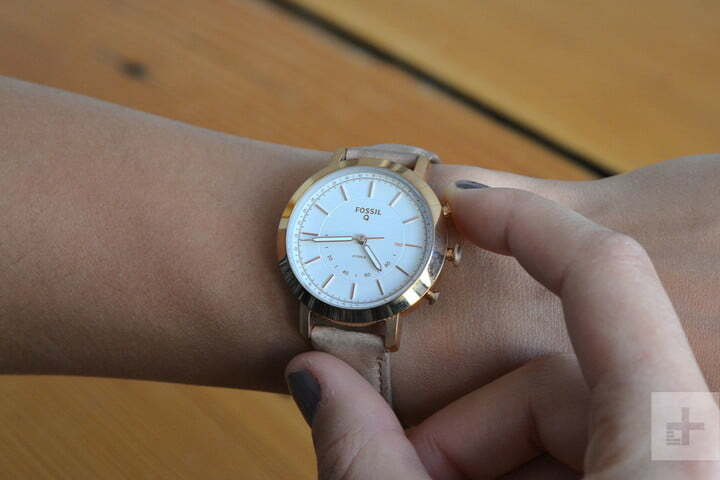 This feature is also available in the unisex Fossil Q Commuter. Hybrid watches also let you identify what apps or contacts you’re receiving notifications from, allowing you to decide whether to pull out your phone and interact with them. You can set various apps or contacts to all the numbers on the watch face, far more than hybrid watches like Michele and Skagen Connected allow. Once you set a contact or app to numbers 1 through 12 on the clock, both watch hands will point to that specific number for a few seconds if a corresponding notification comes through. For example, if you set your mother as number two, then the hour and minute hands will point to number two whenever you receive a notification from her. The same happens if you set an app to a particular number. Your watch will also vibrate when you receive any notifications, texts, or calls, and you can set the vibration strength for each. We thought we’d try out assigning more than one app and contact to each number. We added Facebook, Twitter, Snapchat, and one contact all under the number one. It quickly became difficult to remember the exact apps and contacts we set to each number — it will take some time to memorize this method. We recommend grouping apps like you would with folders on your smartphone. Setting work-related apps to number 1, for example, may be easier to remember than a random collection of apps. That way you still know the notification is work-related or not, and can react accordingly. Still, while the option to group all these apps and contacts together is nice, it may be simpler to set one app or contact per number. If all of this sounds a bit too complicated, you may want to start looking at smartwatches that offer digital displays instead. The Q Neely merely tracks the number of steps walked, but open the app and you’ll find a few more details such as calories burned, distance traveled, and more. You can set a number of steps to hit per day as a goal, and you can review the your goals over the past month. Fossil’s data was mostly accurate, with a difference of a few hundred steps. The Fossil Q Neely is capable of tracking sleep as well. Since it’s lightweight and small, it’s not as much of a burden to wear throughout the night, but it’s still not as comfortable as we’d like. The sleep tracking data is accurate, recording the correct amount of time we spent awake and asleep. 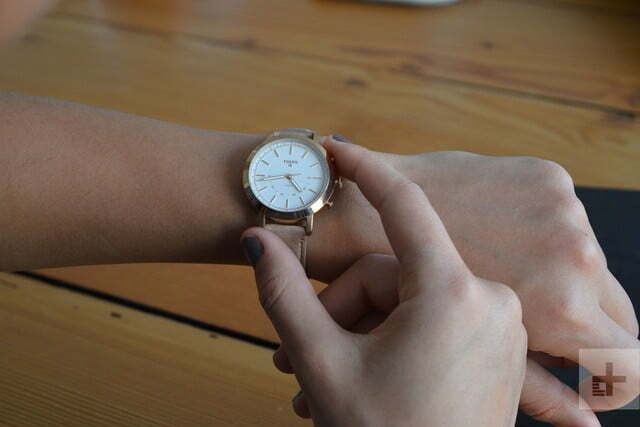 With most hybrid smartwatches, you don’t have to worry about charging them every night. The Fossil Q Neely uses a coin cell battery that should last you anywhere from six months to a year. We wore our Q Neely for more than a month with notification settings on, and we have only hit 87 percent. 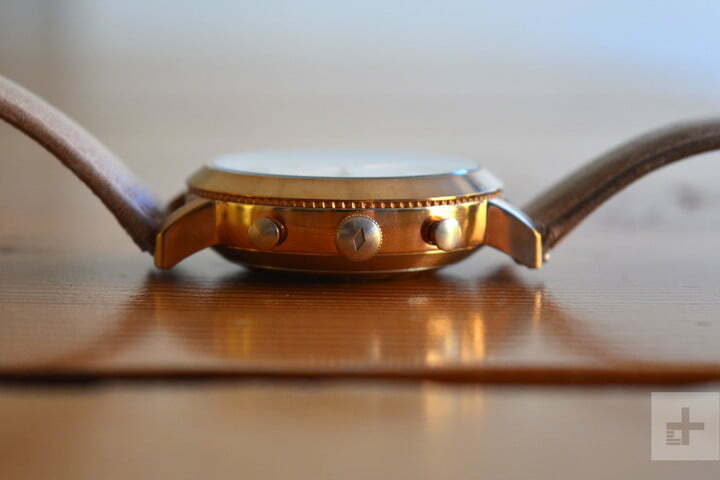 Even better, the battery is dead simple to replace via the back of the watch. To keep track of your battery percentage, check the Fossil Q app. The Fossil Q Neely will cost you $155 for each of the three colorways. 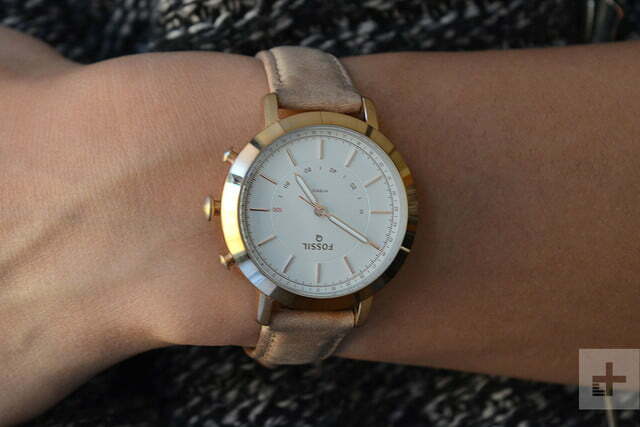 For such a luxurious looking watch that includes a handful of convenient smart functions, it’s priced affordably. 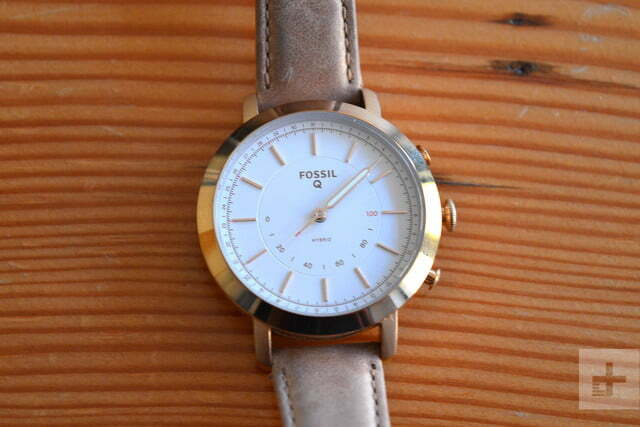 You can buy one now on Fossil’s website.